The main character of the story. He was originally a human and a normal college student until he encountered a female ghoul named Rize who was posing as a human at the time. Rize, using Kaneki's crush on her as leverage, managed to lure him into an alley and tried to eat him but ended up dying when construction beams fell on top of her. Kaneki, already in a half-dead state from Rize's attempts at killing him, ends up in a hospital and has some of Rize's organs transplanted into his body. This results in him absorbing some of Rize's powers and characteristics, such as a ghoul eye, powers of regeneration, and the inability to stomach human food. 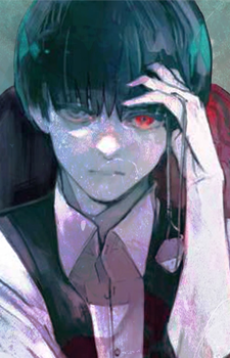 Terrified and lost, Kaneki's life takes a dramatic turn from then on as he tries to find a place for himself in the world, realizing he now belongs to neither the human nor ghoul world and refusing to eat humans to sustain himself. Meeting some of the ​other ghouls, as well as humans, makes him realize that things aren't just black and white and that there are more to ghouls and humans than originally thought.